A LED power inverter is a high quality power supply that takes AC (the power in your house, United States) and converts it to 12v DC, a very common and usable power source for powering leds or other projects. 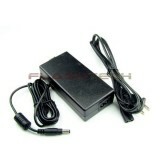 With this particular power supply you can simply plug it into the wall and be done. This inverter is suitable to power one roll of RGB strip lighting. It can also be used to power multiple or single color rolls as well. A high quality power supply that takes AC (the power in your house, United States) and converts i..